Call us for a free basement wall repair quote today! We serve Duluth, Superior, Minneapolis, and many nearby areas in Minnesota and Wisconsin. At DBS we can fix foundation issues related to bowing, buckling basement walls of all types. Our wall anchor systems include a 25-year warranty against manufacturing defects, as well as a performance warranty from us. 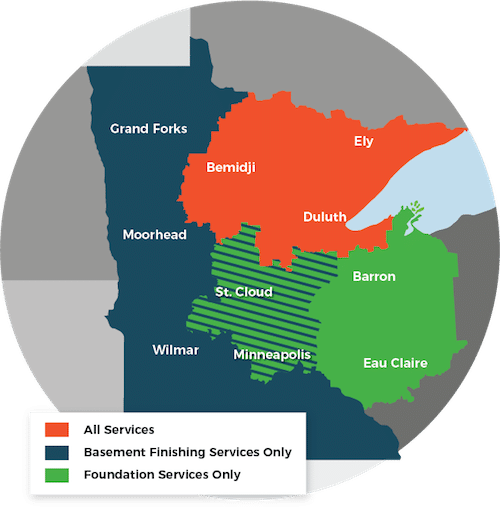 We're proud to serve Superior, Duluth, Minneapolis, and many other parts of Minnesota and Wisconsin.